Ethereum (ETH) price on a crossroad, jump to $240 or slide to $60? The Ethereum price simply cannot free itself from its dicey situation. After the last updates pointed out the weakness of the coin again and again, Ethereum doesn’t look any better today. The lower edge for a renewed downward thrust is 108 US dollars. 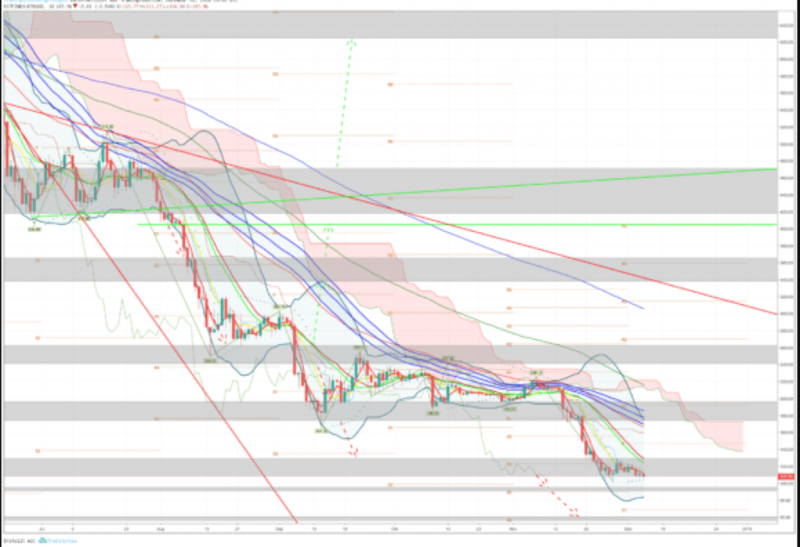 Ethereum was able to prevent this again and again by means of a daily closing price. The cloud of the Ichimoku-Kinko-Hyo-Indicator is still extremely far away, currently 55 percent. The sell signal of the moving averages has been activated since 204 US dollars. Until this is resolved, a substantial upward thrust is required. Price is sinking but the Ethereum is brewing on the technology front, hundreds of world-class developers paving the way for Ethereum to become the world’s supercomputer and operating system. Ethereum and all of its Dapps are the showcase for what blockchain is and what it can do and how it can change the world. No doubt, there were lots of toxic ICOs that clogged up Ethereum, robbed off their investors and gave ETH a bad reputation in 2017. However, these scammy and worthless projects are rooting themselves out by utter incompetence and legal noncompliance and the good ones are popping up and getting traction among users. There are many more dApps worth mentioning but that is beyond the scope of this article so we will briefly touch upon only some of the most known and working dApps. Augur is working as a fully-decentralized, open-source prediction market platform built on the Ethereum blockchain for any and all predictive markets. FunFair is a decentralised gaming technology platform which uses the Ethereum blockchain, smart contracts and their own Fate (State) Channels to deliver casino solutions with games that are “fun, fast and fair.” FunFair has been launched for many months now and they working on obtaining legal licenses across different jurisdictions. Golem has branded itself as “the worldwide supercomputer.” Golem Brass beta was released on the mainnet in Q2, allowing users to sell their computing power and earn real GNT for the first time. OmiseGo is the Plasma decentralized exchange, hosting an open-source digital wallet platform created by parent company, Omise, connecting mainstream payments, cross-border remittances, and much more. They had their White Label Wallet SDK public release which is one of the most useful tools in the developers’ arsenal.